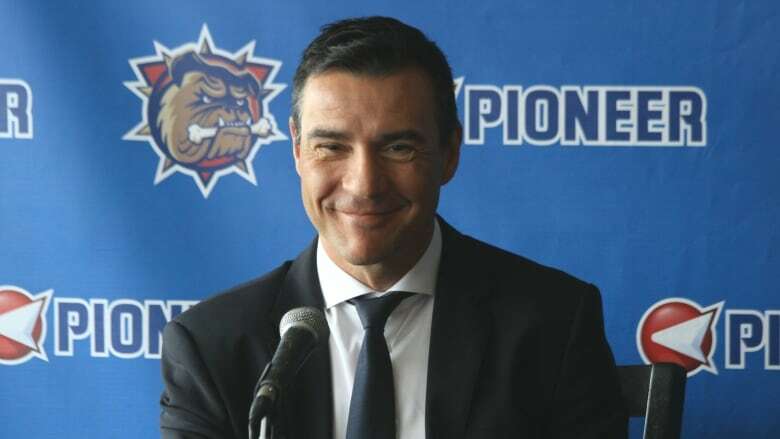 Hamilton native Steve Staios will be the Hamilton Bulldog's next president. The former Toronto Maple Leafs assistant coach, and 1000-game NHLer is to be introduced as president by the OHL team Friday morning. Maple Leafs president Brendan Shanahan had some encouraging words for Steve Staios when he heard about the offer he had from Hamilton Bulldogs owner Michael Andlauer to become the team's next president. "He had some pretty funny comments. But basically he told me I'd be an idiot if I didn't take this chance," Staios said as he was introduced as the team's president Friday morning. 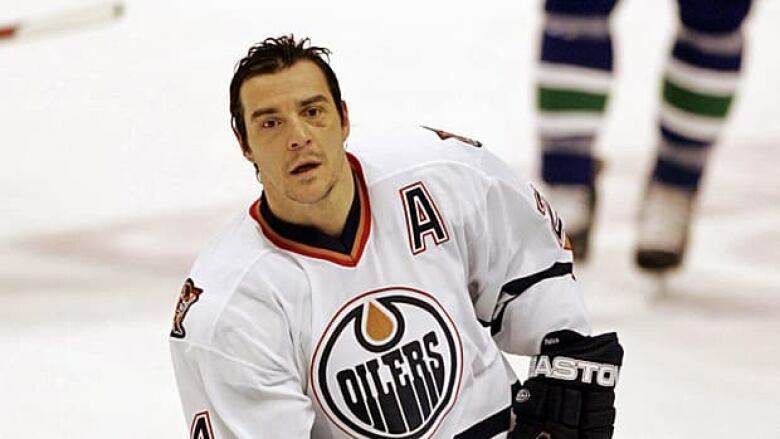 Staios is a Hamilton native, journeyman defenceman and sometimes winger who logged 1,0001 games in the NHL and made it to within one game of the Stanley Cup with the Edmonton Oilers. In doing so, he left the Toronto Maple Leafs organization where he spent the last three seasons as a player development advisor. In January, he was brought down to the bench where he served as an assistant coach in a disastrous second half of the season for the Leafs. Staios thanked the Leafs for giving him a chance immediately after he hung up the skates after 18 seasons in the NHL. Hamilton's Steve Staios retired in 2012 and joined the Toronto Maple Leafs front office. (Chuck Stoody/Canadian Press)"I had a good relationship with Brendan Shanahan, (director of player personnel) Mark Hunter and (assistant general manager) Kyle Dubas and the development model was really starting to take shape, so I'm proud of what I was able to accomplish," Staios said. "We have some structure there we feel like it's a seamless transition now, me moving out and Scott Pellerin who was my assistant manager he's going to move into my spot." "It would have been an interesting run in Toronto for the next three to five years with development probably being at the top of the list with that group, with the rebuild in the future … But this is as good of a situation for me to be in." This is the latest announcement of local talent being added to the Bulldogs from majority owner Andlauer. Since separating from the Montreal Canadiens and gaining more control, the Dogs have added Peggy Chapman, chief of staff to former mayor Bob Bratina as their new director of community relations, and Hamilton native Troy Smith as associate coach. Both Andlauer and Staois talked a lot about looking to Hamiltonians to create a deep sense of community with their OHL team. "We want the team to have an identity that the community can really connect with," Staois said. 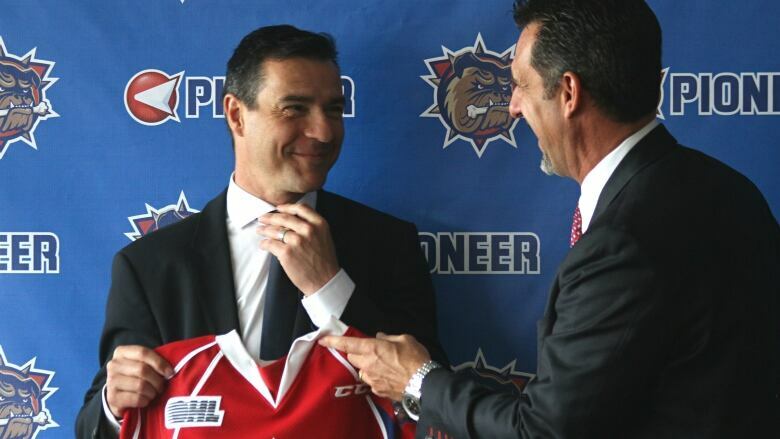 Steve Staios was hired on as the Hamilton Bulldogs latest president Friday morning. (Jeff Green/CBC)"I was able to look at the business in a different light," Andlauer added. "I knew that I only had one chance to make a good first impression. You know there's some doubters out there that you know a lot of teams have come and gone in Hamilton, the OHL front some people think that this building is much too big for the OHL." "I love a challenge and this is a a challenge that I'm not going to take lightly." Staios played under current Hamilton Bulldogs general manager and coach George Burnett in Niagara Falls in 1991 and 1992. He was Burnett's first draft pick. In the Leafs organization, he was brought in to teach some of the younger players on the blue line, specifically Jake Gardiner and Morgan Rielly, following great results working with first round pick Stuart Percy as a player development advisor. Maple Leafs assistant general manager Kyle Dubas said, in a press release "We are truly thankful to Steve Staios for the valuable role he has played within the Leafs organization. We are also excited for Steve as the Bulldogs set roots in his native Hamilton — he will serve that club and community incredibly well." The Leafs have named Scott Pellerin as Staios' replacement as director of player development. Staios was a 27th overall pick, playing with the Vancouver Canucks, Edmonton Oilers, Atlanta Thrashers (where he served as team captain), Calgary Flames and New York Islanders. After his playing career wrapped up at 1,001 games, Brian Burke brought Staios in as player development advisor for the 2012-2013 season. In last year's train wreck season for the Leafs, Staios was tapped to help out on the bench. In April, as head coach and fellow Hamilton-native Peter Horachek was fired, Staios returned to his job as manager of player development. When Burke hired Staios described him as a person who "has tremendous character and leadership skills and he has a bright future" in hockey. Staios replaces Stephen Ostaszewicz, three years after he was brought on to the then-AHL Bulldogs as president.